Creative Triangle are thrilled to have successfully tendered to be on The University of Warwick’s Creative & Design framework. Having worked with Warwick for 4 years already we have formed great working relationships and have a deep understanding of the University’s unique vision and goals. We are excited to be able to continue working with Warwick and look forward to helping promote the University through clever and creative design. 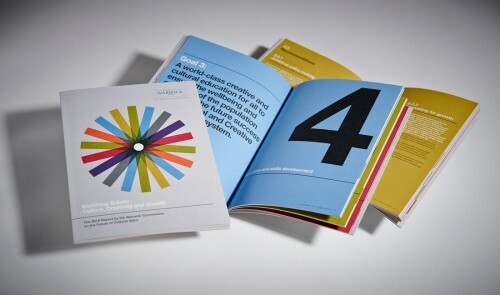 Following the launch of their new brand earlier in the year, it was paramount that the University of Warwick’s postgraduate prospectus, a key piece of student recruitment collateral, reflected Warwick’s unique strengths and vision. To aid navigation we colour coded the faculties, we left large areas of white space to make the information easier to absorb and used the triangle device to break up the copy and hold imagery. 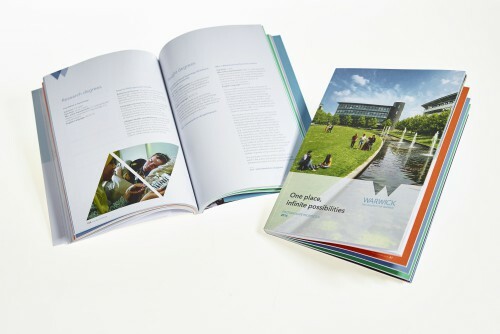 Through the bold application of the inspiring new brand, this 194pp perfect bound brochure with UV spot finish helps to position Warwick as a world leading university. Introducing the final report by The Warwick Commission on the Future of Cultural Value titled Enriching Britain: Culture, Creativity and Growth. The 72pp perfect bound report features a book jacket with a spot white foil finish and draws inspiration from Swiss Style modernism. We used bold typography to make sure no reader would miss the Commission’s key recommendations and the most poignant statistics. The cover illustration was designed to symbolise the Cultural and Creative Industries Ecosystem – each of the nine industries overlap – together they form the Ecosystem.